Digitrax has recently released it's entry into the keep-alive device market. It is rated at .16F capacitance so it packs plenty of power to assist locos through dirty track and dead frogs. It comes pre-packaged with a 10-pin Sound harness and Digitrax SP26158B 8 Ohm 1 watt Speaker w/ Enclosure. It's a pretty good value really considering the unit sells at SBS4DCC for about $25 and the speaker alone would set you back $10. It is important to note that the PX112-10 harness is made specifically for the Digitrax Series 6 sound decoders and should not be used directly with any other model decoder. 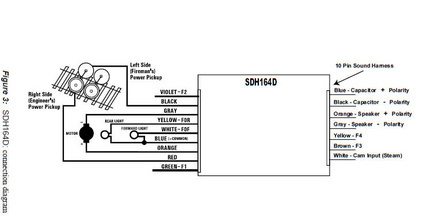 As the following diagrams show, the pins for the capacitor on the SDH164D are in a different location than on the SDH166D. A visual inspection confirms that the capacitor is on different pins on each decoder. Additionally, this harness should not be used with the SDH164D because the amp is rated for speakers having 32 ohm impedance. The speaker on the PX112-10 is has 8 ohms impedance. It is possible to use the PX112 with a SDH164D. 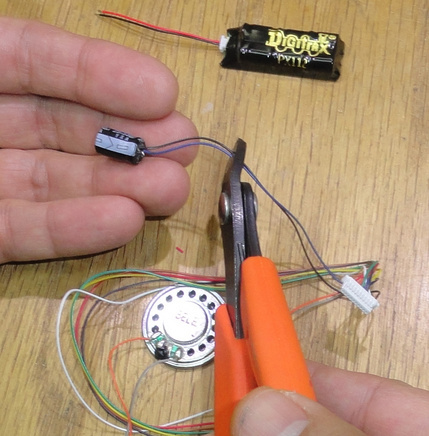 First, cut the PX112 wires on the PX112-10 harness at a convenient length. 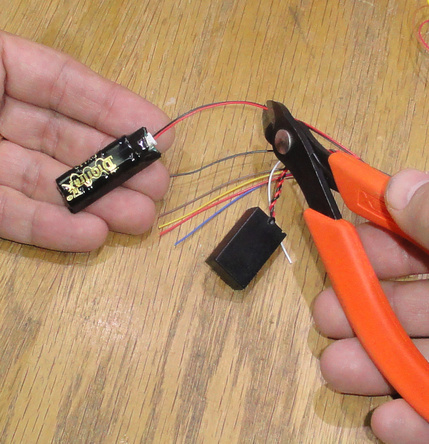 Second, cut the stock capacitor wires on the SDH164D at a convenient length. Third, solder the PX112 wires to the SDH164D capacitor wires and insulate the solder joints. Note that the Capacitor Positive wire on the SDH164D 10-pin Sound Harness is blue. 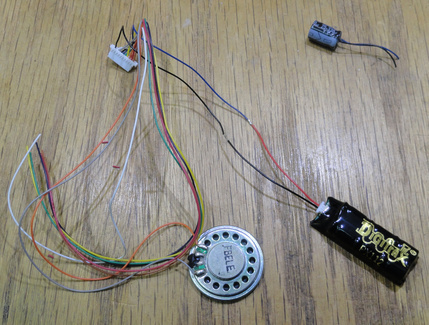 You can connect a PX112 or other keep-alive device to the existing SDH166D 10 pin harness which can be handy if the speaker is already mounted in a model. I have not tested this but I am told the SDH166 uses pins 5 and 7 to provide power to both sound and motor. The original capacitor uses pins 6 and 10. 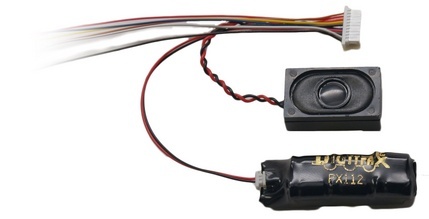 The PX112 can be used with any other decoder on the market when it is removed from the 10-pin harness. It is connected just like any other capacitor. Red is positive, black is negative. Be sure to observe proper polarity or it will be destroyed just like any other capacitor. Multiple units can be used in a single installation if you so desired by wiring them together in parallel.